Matt Terry, the Director of Planning for the City of Bellevue was honored last night at Meydenbauer for his 30 years of leadership and public service at a retirement celebration at Meydenbauer Ceneter last night. Among Matt’s many accomplishments, he leaves a visionary master plan for the Bel-Red Corridor. As part of that landmark planning effort, the Bellevue Arts Commission was invited to the table to contribute to the cultural vision for Bel-Red. As a result, the development of an arts/cultural district, as well as integrated public art and the identification of environmental art opportunities were thoughtfully considered in the planning process. Exciting developments for the BAC! 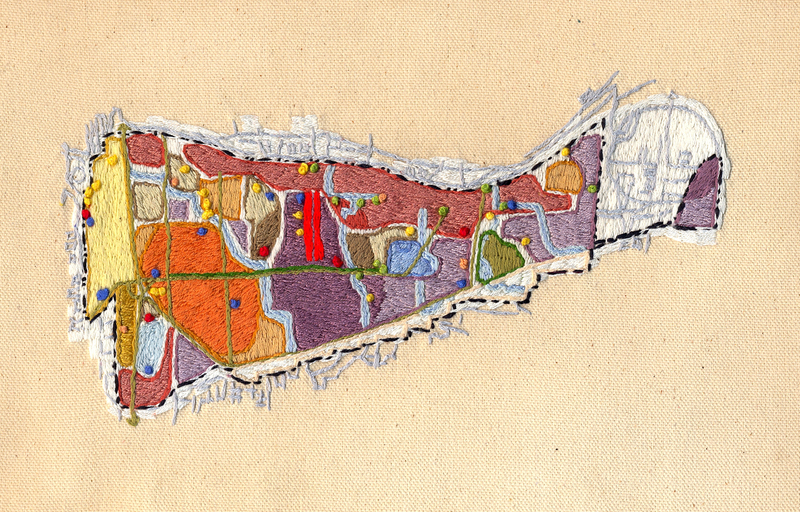 As a gesture of gratitude, the members of the Commission (Mary Pat Byrne, Betina Finley, Judy Holder, Brad Smith, Valentina Kiselev, Roxanne Shepard, Bill Ptacek and myself) privately commissioned Seattle artist, Mariko Hirasawa to create an embroidered interpretation of the sub-area map of the Corridor. The piece entitled, “The Cultural Fabric of Bel-Red”, identifies exisiting arts and cultural assets such as the Pacific Northwest Ballet School, Francia Russell Performing Arts Center, Mike Lull Guitar Works, Donn Bennett Drum Studio, Evolution Studios, Northwest Guitars, American Music, Mill Music and others with colorful French knots. Aside from his many citywide contributions, Matt Terry has stretched and primed a beautiful canvas with his team’s master plan. With such a solid foundation, the community now can begin to imagine the possibilities and start to apply color (and MORE FRENCH KNOTS!!!) to this pioneering frontier that is perfectly poised for creative and entrepreneurial industry settlements.